Luxury cruise line Windstar Cruises announces the debut of Star Pride as it re-enters the six-yacht fleet. The 212-guest Star Pride is back in action after receiving a scheduled $4.5 million transformation, including a complete renovation of two exclusive Owner’s Suites featuring enhancements to an expansive private deck that commands a sweeping ocean view over the yacht’s bow. Also included were nautically-inspired remodeling of public spaces, dining venues and more throughout the yacht. The 2016 Star Pride $4.5 million transformation builds on earlier renovations now matching all guest accommodations and features of sister yachts, Star Breeze and Star Legend. Total investment in refurbishing the three yachts is over $21.5 million dollars in the last two years. Suite Upgrades: Two Owner’s Suites were completely rebuilt with a new indoor-outdoor floor plan and interior design featuring new linens, towels, furnishings, windows and drapery. 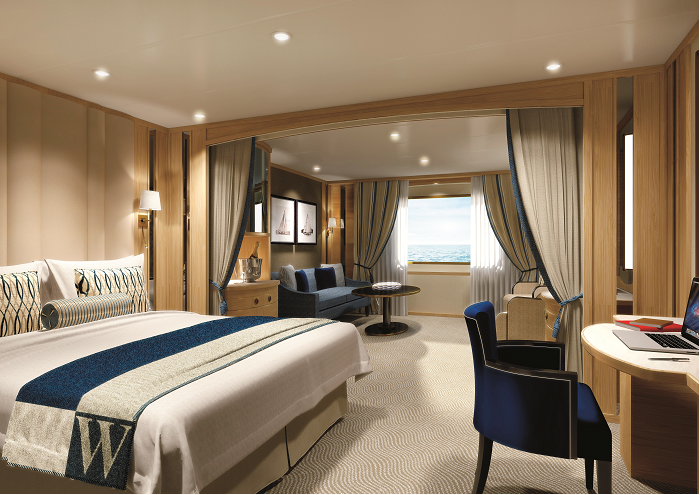 Guests staying in one of the two exclusive suites will enjoy a new, extended private deck area with spectacular views over the bow of the ship. In addition, all luxurious guest suites on the yacht received stylish new coffee tables, and new flat screen televisions. Comfortable sofa beds were added in the living rooms of 12 select suites now offering triple accommodations. Public Spaces: All guest stairways and hallways were redone in Windstar blues and earth tones, conveying a unified nautical theme throughout the elegant yacht. New carpets and tile flooring were also added to stairwells and all indoor public spaces. The Lounge: the former entertainment lounge now includes new flooring, lighting, sound system, and furniture. The newly created elegant ambiance makes the show lounge an amenable space for entertainment, meetings and small gatherings. Veranda: the restaurant in the aft of the yacht expands its outdoor seating to a new courtyard area, complete with a succulent garden wall. Star Deck: the top outdoor deck expanded by four feet on each side, giving additional space for guests to relax on deck chairs. The Star Deck also offers a new counter-current pool and whirlpool. Library: the Library has been updated with softer colors, new furnishings and new artwork. Star Screening Room: the space transformed from a card room to an intimate screening room where guests can watch the latest movies and play video games. Fitness Center: the new gym layout includes new flooring, wallcoverings and window treatments for a cooler and more refreshing wellness atmosphere. Dining Venues: AmphorA Restaurant, the main dining room on board, completes its redesign with new flooring, wall coverings, lighting and seating layout. A new public bathroom was added adjacent to the entrance. Veranda restaurant has opened up a 180 degree view of the ocean by adding sliding glass doors and an aft glass wind screen. Veranda also offers expanded outdoor seating in the new courtyard which is complete with a virtual garden wall. Visit the Star Pride Facebook album to view imagery of Star Pride’s upgrades. Star Pride sailed from the port of Athens on June 9 embarking on a newly-developed 7-day itinerary, Treasures of the Greek Isles. The classic yachters’ journey across the Aegean Sea calls at Nafplio and Mykonos, Greece; Kusadasi, Turkey; Patmos, Santorini, and Monemvasia, Greece, returning to Athens. The new itinerary has another scheduled departure on Sept. 4, 2016. The sailing introduces cruisers to the hidden harbors, island culture and ancient treasures of the region. Cruise highlights include the opportunity to visit up to nine UNESCO World Heritage Sites as well as a complimentary Windstar Private Event featuring a once-in-a-lifetime candlelit dinner at the renowned Celsus Library in the ancient city of Ephesus, Turkey. Star Pride will sail throughout the Mediterranean during the 2016 summer cruise season featuring popular cruise itineraries such as Classic Italy & the Dalmatian Coast and Glitter & Glam of the Rivieras. In October 2016 the yacht offers a relaxing Atlantic Ocean Crossing cruise and then sails a few Caribbean cruises including the Best of the ABC Islands and ever-popular Jewels of the Windward Islands with ports less-visited. In December, the yacht transits the Panama Canal and will offer a series of Costa Rica & Panama Canal cruises into early March of 2017, when it returns to the Caribbean for three cruises prior to her Ocean Crossing in April. The 2017 Europe season sees Star Pride yachting across Europe with cruises to the Mediterranean, and new for Star Pride in 2017, Northern Europe cruises including: Around Iceland, Lands of the Midnight Sun, Best of Europe’s West Coast, and Gaelic Explorers, all explored in private yacht style. Star Pride was the first of three elegant all-suite yachts to join Windstar’s fleet in the last two years, now at a total of six yachts, including sister yachts Star Breeze, and Star Legend, as well as the classic Windstar sailing yachts Wind Surf, Wind Star, and Wind Spirit. Windstar yachts offer guests the chance to travel to 150 international destinations, small secluded ports, hidden harbors and iconic cities, all in Windstar’s signature private yacht style, immersing guests in local cultures around the world offering a vacation experience truly 180 degrees from ordinary. For additional information, including daily itinerary highlights, special offers and product information, contact a travel professional, call 800-258-7245 or visit Windstar Cruises online at http://www.windstarcruises.com.